I am one of three partners at The PRG Group. We are a luxury custom builder in Big Sky and The Yellowstone Club. Big Timberworks is a trusted subcontractor and team member of PRG. 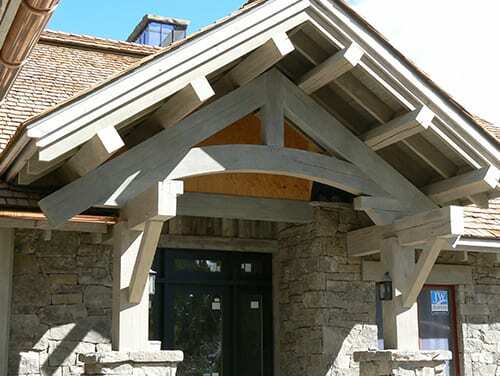 They have provided and installed the reclaimed timber packages on 6 of our Yellowstone Club homes in the past year. Their craftsmanship and attention to detail have been at the highest level. The staff at Big Timberworks are straightforward and professional; we are proud to have them on our projects. We have more projects on the drawing board with BT and look forward to a long relationship. 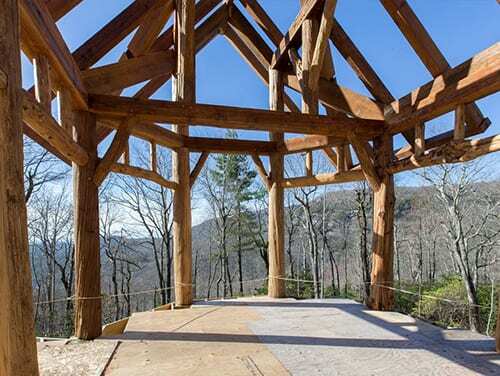 What I experienced at Big Timberworks was the intersection of art and master craftsmanship, demonstrated by exceptionally talented and creative perfectionists. It’s rare these days to receive such attention and commitment to excellence, but the team at BT greatly exceeded even my very high expectations. 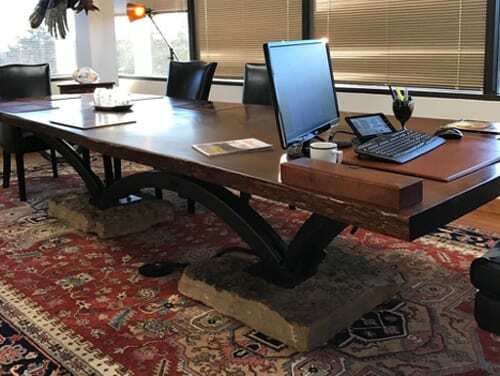 Originally I had merely indicated I wanted a conference table that combined a live edge slab with metal and stone. What I got as a result was a one-of-a-kind, museum quality, heirloom that will still be enjoyed, God willing, for generations to come. The quality of work and devoted attention to detail demonstrated by everyone at BT is nothing short of inspirational. The legacy of Merle Adams will live on forever with the talents of the group at BTW. 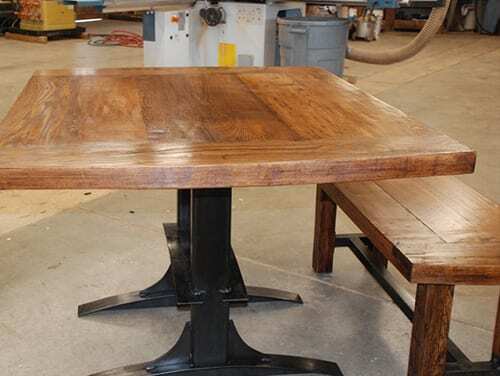 For many years I wanted to add a final touch to our beautiful home with a live edge dining room table. We decided on Big Timberworks for the project and are very glad we did. 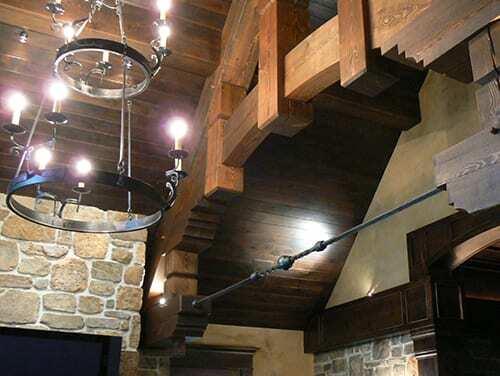 From the get-go, Scott worked closely with us in picking out the best piece of wood, and designing the structural underparts to match the decor we wanted in the house. The piece was built on time and on budget. Even more impressive was that after the fact, an unforeseen problem occurred with the wood, which Big Timberworks, without hesitation, took on and corrected without any additional expense. Their willingness to stand behind their work was exemplary, and sets them apart from most. I could not recommend any company higher. Big Timberworks has exceeded our expectations for over 15 years. Time and time again they bring materials and talents to our timberframe projects that help us achieve results better than we could imagine. Big Twig is the real deal and we count ourselves fortunate to work together. 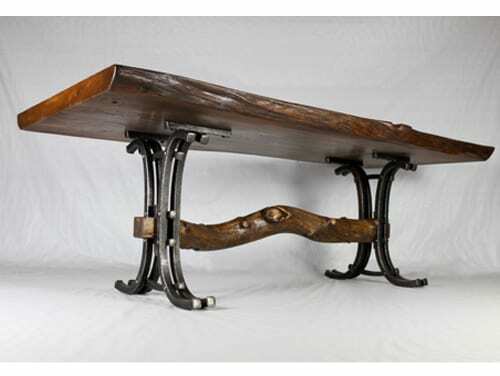 Kim and I choose Scott Carlson and Big Timberworks to craft our dining room table. From the selection of the wood for the table top and the unique design, Scott and Big Timberworks worked magic to produce an heirloom piece for our Montana home. The craftsmanship and attention to detail were superb. We would work again with Scott and Big Timberworks on any project in the future that requires exceptional creativity and superb craftsmanship. 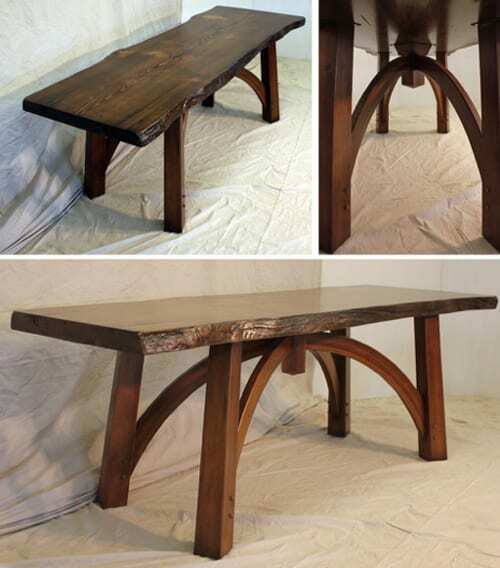 Competitor – for twenty years I sold special projects at Benson Woodworking. I lost several fine jobs to BT, but never worried that we had been undercut, nor that the client would not be well treated. Colleague – working on Timber Framers Guild Projects and sharing a wild rush job in Terre Haute. Client – BT has honored us with several fine and fun jobs with challenging structural components over the past seven years. Their projects are never boring. Friend – I am proud to consider myself an old friend of BT. They have hosted me many times over my years of travel. Merle provided me needed moral support, as I turned fifty heliskiing in Banff. GREEN – When I say BT is green I am not speaking vaguely and about only arguable savings. 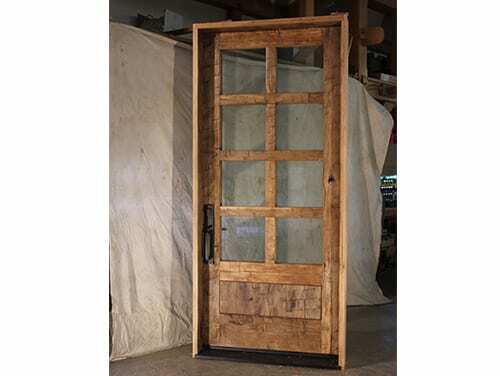 BT was an early and enthusiastic recycler of building products, and has gotten so good at it that their patinated look is sought for its own aesthetic. BT also adopted and pursued high energy efficiency building techniques. They even try to guide clients’ designs to down-size; an ongoing effort to buck trends. CREATIVE – I love touring finished BT projects, looking at new applications for old and used materials. Sinks made from unlikely objects, hand rails from lift cables, floors of who knows what. CRAFTSMANSHIP – The level of finish detailing that BT seems to seek is not just high, but appropriate. They do not, simply, just go for perfectly tight fits every time. Rather, they vary the level of fussiness to the actual need for the place in the building. INNOVATIVE – As a structural engineer, I have long enjoyed BT’s efforts in seeking new ways to build (and pre-build) walls and support roofs. They simply never seem to stop improving even the stuff we do not see in the finished building. When building our new house, we decided we wanted to add a few special pieces to make the house feel uniquely our own. 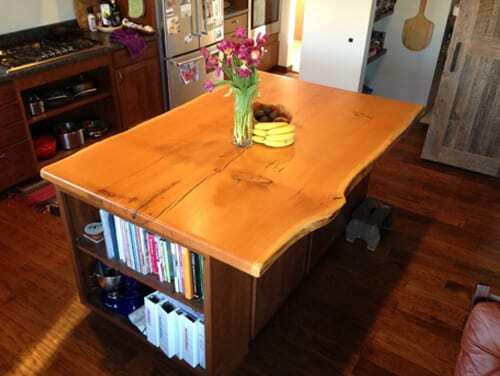 We worked with the friendly, attentive, and skillful staff at Big Timberworks to pick out some beautiful live-edge pieces to make a Douglas fir kitchen island and cherry shelves. 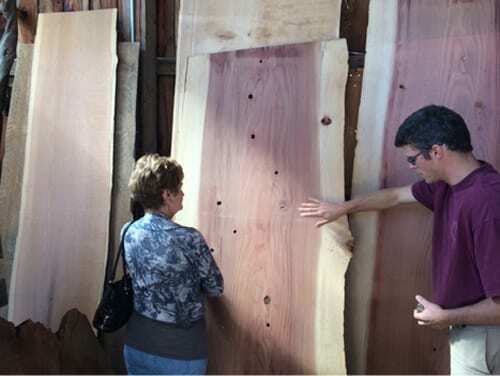 The staff spent considerable time going through various pieces to find those that were just right for us. Our entire experience with Big Timberworks was great from start to finish, and the final products exceeded all of our expectations. The island and shelves have given our house the special feel we had hoped for when we came to Big Timberworks. I loved working with Scott at Big Timberworks. He is so creative, and creates custom one of a kind designs with beautiful materials. The wood and metal work is exceptional. It was easy to work with a true artist of his trade! 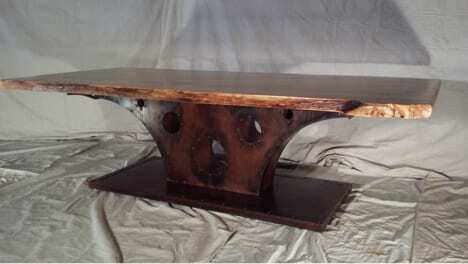 I have used him for designs on multiple projects and will return to Big Timberworks again to work with them. Our congregation decided to work with Scott at Big Timberworks because we wanted a local craftsman who would be responsive to our vision and have a deep connection to the culture and feel of the Gallatin Valley. From the first stages of the project to delivery, the entire team at BT exceeded all our expectations. Scott guided us through the process to design an altar, pulpit and baptismal font that matched our vision and our building, and executed the pieces with a craftsman’s skill that leaves an impression on everyone who enters our building. We couldn’t be happier!